The panel has been extended at the top: the original part is one board of Baltic oak, horizontal in grain and about 27 cm high. Sections of the unpainted edges survive on all four sides. The last ring in this original part of the panel was formed in 1418. Above is an addition, also of oak; it is cut into an arched shape fashionable in the late fifteenth and early sixteenth centuries. Dendrochronological investigation of the addition has not been possible. A horizontal split through the donor`s eyes has caused some paint losses; otherwise the picture is in good condition. X-radiographs and infrared reflectograms reveal that the figure of the donor has been much altered during the course of painting. The original donor had a smaller head, turned further towards the viewer; his robe fell diagonally from his shoulder and was not belted; his sleeves were narrower; he did not wear a hood across his shoulders; his neck was perhaps covered by a high collar; his hair may have been cut in a tonsure. The Crown of Thorns and the cloth on which it lies were added on top of the greenish browns of the landscape and the red of the visible donor`s robe. 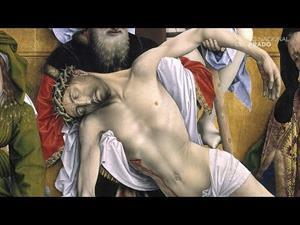 An almost exact copy acquired in Florence in 1910 for the Gemäldegalerie in Berlin shows the composition with the extension at the top, there enlarged into a rectangle, the altered donor and the inserted Crown of Thorns. It is on an oak panel measuring 46 x 33 cm, the last ring of which was formed in 1495. Though the colours correspond with those in the Prado picture, in the Berlin version they are mixed with larger quantities of white and are therefore paler and more opaque. In a picture in Brussels, the Virgin, Christ and Saint John reappear with the Magdalen taking the donor`s place but here positioned in front of the rocky outcrop. The Virgin has arranged her mantle to cover her white veil. Saint John`s head is underdrawn in the position that it occupies in the Prado picture but in the painting is rotated to our right. More of his body is visible, including his left foot. A smaller and rather inferior version, formerly in the possession of the Mangoni family in Naples, was sold at Sotheby`s in London on 4 December 2013, lot 1. There the Virgin, Saint John, Christ and the distant landscape on the right repeat almost exactly the corresponding parts of the Prado picture; but the Prado donor is replaced by a Magdalen, very similar to the one in the Brussels Pietà. The Virgin and Christ reappear in a Pietà with Saint Jerome, a Dominican Saint and an unidentified Donor in the National Gallery in London. A small version showing only the Prado donor`s head, painted on canvas, is of uncertain date and significance. The figures of the Virgin and Christ in all these paintings are adapted, and reversed, from the centre panel of the Miraflores Triptych (Berlin, Staatliche Museen, Gemäldegalerie, inv. 534A). There the Virgin is in a more credible but more complex pose. Kneeling on one knee and linking her fingers, she has a much more secure grasp of Christ`s dead body. His feet are together, as they would have been on the Cross, and his head is forced sideways by the fervour of her embrace. His body is rigid and its axis is on a straight line at 45 degrees to the horizontal, whereas in the versions the axis of his body is not straight and the geometry of the composition is less exacting. In the Miraflores panel, the hands and feet are foreshortened; while in the versions they are in less complicated poses. 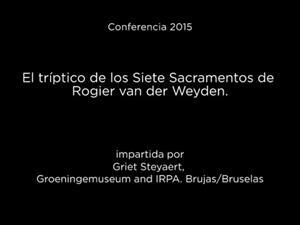 It seems that Rogier adapted the Miraflores Pietà to produce a simplified design where the iconographical complexities were omitted, where the most difficult foreshortenings were avoided and where the Virgin was less elaborately dressed, with her white veil revealed. This adaptation is altogether less credible but, unlike the Miraflores composition, it could be easily reproduced by assistants who were not such gifted and practised draughtsmen. 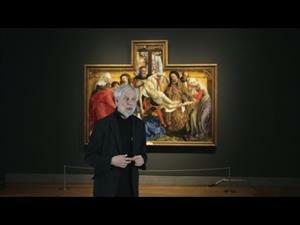 Saint John, not copied in the London Pietà, is present in the Prado, Brussels and Mangoni versions. He is not taken from the Miraflores Triptych but corresponds, in reverse, to a figure in Rogier`s Virgin and Child with Six Saints, now known only from fragments and copies. A section of this Saint John survives, including parts of both his feet, on the left of the fragment of the Magdalen reading. The whole figure is recorded in drawn copies in Saint Petersburg and Stockholm, where John is supporting the book in which the Christ Child is writing; both his feet are visible. This figure has been reversed and slightly adapted to support the group of the Virgin with the dead Christ. It seems likely that the figure was created for the Virgin and Child with Six Saints and adapted for the Pietà compositions. In the Prado and Mangoni versions, his figure is curtailed on the left so that his left foot vanishes. The figure is more or less complete in the Brussels version, but his head has been moved and his hands and draperies altered during the course of painting. Only in the Brussels version has the Virgin concealed her veil under her mantle, as in the Miraflores Triptych. The Miraflores Triptych was painted before 1445; the Virgin and Child with Six Saints was probably painted in about 1438. 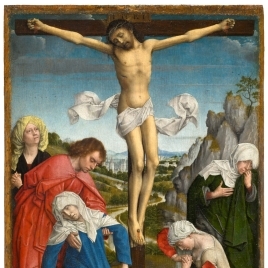 In the Pietà compositions in the Prado and Brussels, the group of the Virgin, Christ and Saint John has been taken from those two sources; it is likely to have been created during the 1440s. As the visible donor in the Prado Pietà is dressed according to the fashions of about 1440, there may be a difficulty; but he may have been conservative in his tastes or his robe may be a livery of some description. Liveries and uniforms tend to lag behind high fashion. The original donor may have been a tonsured cleric in an unbelted habit; but it is not possible to suggest a date for him on grounds of costume. There is no reason to believe that much time elapsed before he was replaced by the visible donor. It seems likely that this happened before the panel was enlarged late in the fifteenth century or early in the sixteenth century. It is possible that the Crown of Thorns was added at the same time: the technique is less refined than that of the figures but has affinities with that of the clouds in the added section. The Berlin copy can be dated on dendrochronological grounds around or after 1510. 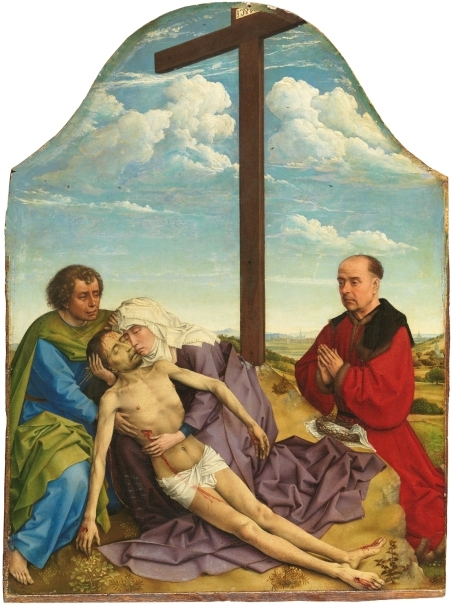 Comparison between the Prado Pietà and the centre panel of the Miraflores Triptych demonstrates Rogier`s skill in simplifying a composition in terms of iconography and drawing so that small-scale versions could be easily produced. The images could be adapted according to the wishes of different clients. The added figures often look awkwardly integrated and a little out of scale -the donor in the Prado picture; the Dominican in the London version. The extant versions appear all to be by different assistants who worked independently of one another and had very different tastes in colour; but all the versions are distinctively Rogierian in style. 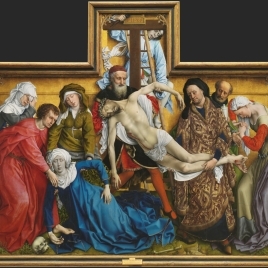 Because many, many such pictures must have been lost, it is impossible to estimate how many would have been painted in the Van der Weyden workshop, before and after Rogier`s death. The Prado Pietà is an excellent example of a painting of high quality evidently executed by assistants in Rogier`s workshop. 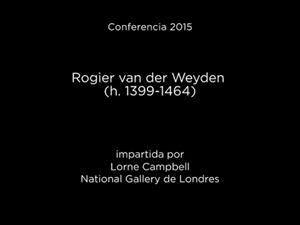 Retaining a distinctively Rogierian character, such pictures must have played a considerable part in spreading his fame and establishing his dominant role as the preeminent painter of religious subjects (Campbell, L.; Pérez Preciado, J. J.: Rogier van der Weyden, Museo Nacional del Prado, 2015, pp. 115-119). Height: 46.8 cm. ; Width: 34.5 cm. Acquired from deceased Fermín Lasala y Collado, Duke consort of Mandas y Villanueva, 1925.